Setting the thermostat too high in winter (try 68 degrees or lower), and too low in summer (78 degrees or higher is recommended). Failing to use a step-back thermostat—one which automatically changes the temperature setting depending on the time of day—or failing to adjust it for day and night needs (or for when people are actually at home). Failing to install appropriate window coverings, or failure to close them to insulate against unwanted heat (summer) or cold (winter), or to open them (when appropriate) to optimize thermal gain. Leaving windows or doors open for a pet, or when it’s too cold or too warm outside. Other energy-wasting habits can increase operating costs for lighting, appliance use, hot water heating, as well as pool, spa, and TV. Smart home integration can help control this waste and save money—by automating the control functions, and by actively monitoring energy use to increase awareness among household members. Monitor and control heating and air conditioning systems; set heating low (and AC high) when away, and adjust temperature settings remotely if plans or weather changes. Remotely select lighting sources, and adjust levels to match the activity or mood. Use occupancy sensors to automatically turn lights off when rooms are unoccupied, and on when someone enters the room. 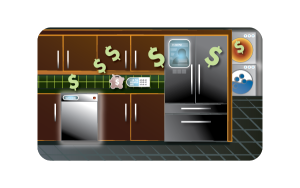 Schedule kitchen and laundry appliances to run when energy rates are low (where time-of-day rates are in effect). Automatically adjust motorized window coverings to maximize solar gain in the winter and minimize energy gain in the summer. Remotely track gas, electric (and even water) consumption in real time, to help household members increase their awareness of usage and to promote conservation. Install leak detectors and flow meters on water lines to detect leaks, and alert the homeowner when leak patterns are discovered. Manage water consumption to save on tiered rates. Shut off water in emergencies. Implemented correctly and used conscientiously, smart home monitoring and control features can easily save enough money to pay for themselves—often in a few years (depending on local energy costs and climate). Local Climate and Energy Rates Local seasonal temperatures have a big impact on energy use. Minnesotans need lots of energy for heating in winter; Floridians use plenty of power for summer cooling. In San Diego? Not so much of either. Also complicating the picture is the fact that energy rates differ considerably from locale to locale. Hydro- electric power is relatively cheap in the mountain states, where the “fuel” for power generation is river water (plus gravity). California and Hawaii, in contrast, have some of the highest energy rates in the country —due, in part to the heavy use of natural gas to generate power. Where rates are high, energy conservation quickly translates into saved dollars, plus a short payback period to recoup the initial cost of installation. In places where energy is cheap, the savings from conservation will be smaller, and the payback time longer. Time of Day Use Residential electrical power demand fluctuates significantly throughout the day and night. It is lowest overnight, when most people are sleeping. It peaks briefly at sunrise for showers, hairdryers, and breakfast, then dips to moderate levels throughout the day until late afternoon, when demand begins to climb to a high plateau as people return home to cook dinner, perhaps do chores, and enjoy some entertainment. Much of the energy in the US is still produced by coal-fired generators. While they are relatively cheap to operate, they cannot rev up output rapidly enough to meet increases in demand (which occur when people return from work or school and prepare for dinner.) To match production to this demand, fossil fuel-based power plants turn to gas-fired turbine generators—which can ramp up the power much more quickly than coal-fired generators. Unfortunately, they are more expensive to run because natural gas is more expensive than coal. To help even out fluctuations in demand and reduce the need for high-cost gas-fired electricity, producers for many years have offered power to industrial users at discounted rates that depend on the time of use: nighttime rates are cheapest, when residential use is lowest, and highest during hours that correspond to peak periods of residential use. Smart Electrical Meters Now that power companies have begun to install smart meters in homes, expect them to shift to a residential rate schedule with prices that depend on the time of day the power is used. The goal is to incentivize residential customers to run power hungry appliances at times when most people sleep. When the roll-out of time-of-day rates occurs in your area, you can take advantage of the new incentivized rates by running the clothes drier, dish washer, or even the oven overnight, when rates are likely to be lowest. Of course, some very important energy uses—like morning coffee and a hot shower—are time-sensitive, and unlikely to be scheduled for the wee hours of the morning. In sum, in-home energy monitoring can help you pinpoint your established energy use patterns, and allow you to see the savings that accrue when you work to make the changes that will conserve energy. Smart home technologies also can automatically control energy-related home amenities like lighting and shade control, plus effortlessly schedule the running of non-time-critical appliances to benefit from the most favorable energy rates—so you won’t waste any opportunity to save money and conserve energy. The Condition of Your Home Unless your home is new, or has been upgraded to modern energy-efficiency standards in the last decade or so, it may lose much heat (in winter) or gain much heat (in summer) through the walls, ceiling, windows, unpatched holes and cracks, etc. Older low-efficiency furnaces, air conditioning systems, and water heaters can make matters much worse. All of these conditions waste energy and add unneeded monthly expense. Installing energy-saving smart home technologies can only partially make up for the air leaks, low energy efficiency of furnaces (and air conditioners), or poor insulation values of an older house. But they do make optimizing energy use much easier (and cost-effective) to accomplish, once obvious thermal deficiencies are cured. And keep in mind that many of these home integration features provide benefits beyond conservation. Lighting control, for example, also provides comfort, convenience, safety, enjoyment, and even support for special needs household members, while automated window coverings add convenience, safety, and enhanced privacy. But if your home is already up to date efficiency-wise—or if you live in an area with mild summers and winters—the DOE Energy Calculator probably won’t have much to recommend in the way of energy-saving upgrades for your home. Then you can go ahead and focus on the conservation benefits of the technologies described in the Smart Energy Management section of the Gallery.